Woodenbong, NSW, New South Wales, 2476, and Urbanville, NSW 2475, Australia. Tourist and visitor information, weather info for backcountry and countryside villages of the Wollumbin Volcano. Darlington Community Markets. Darlington State School, QLD 3rd Sunday : March, July, November only. If you make to Urbenville or Woodenbong, you're well and truly in the "woop woops" of the Wollumbin Volcano! This is not to say you've strayed "beyond the black stump", although you'll see a few of these around as a result of the timber getting of earlier times. 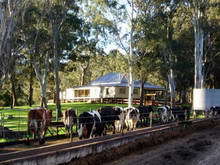 Dairying and cattle raising, some timber milling, and a farm tourism presence are the mainstays, with the Scenic Rim food bowl providing an abundance of fruit, vegetables and gourmet products like olives and cheese, and a now well established boutique winery trail also a popular attraction. If you want experience Australia's rugged backcountry and countryside vistas without leaving civilisation completely behind and heading into the outback, then it's here you'll truly be in wilderness county. Woodenbong holiday accommodation consists mainly of farm cottages, cabins and home stays tucked away on large farms or bush blocks adjacent to nationals parks and reserves. For visitors seeking to truly get away from it all, you'll have found it here. Urbenville Forest Park is a picnic area and camping ground in a forest park on Urbenville town boundary. Camping and caravan sites, picnic facilities, fireplace/BBQ and toilets are available. Woodenbong Camping Ground has been upgraded with a shelter providing undercover seating and including a kitchen with 2 electric BBQ’s and a sink. Amenities and hot showers are a $1., and there's a Dump Point (free use). It is run totally on a voluntary basis by Woodenbong residents through the Woodenbong Progress Association and is found to be a great location and well maintained. If heading north into Queensland, Woodenbong is your last chance to stop stretch your legs and re-fuel before beginning the climb over the "scenic rim", where the Tweed and Focal Volcano group activities overlap. Spectacular views of such landmarks as the tabletop outcrop of Mount Lindesay will have you craning your neck, so pull over and stop in a safe place to get a better look and take those iconic photos. Open your vehicle windows and listen out for the distinct and constant "tink tink" calls of Bellbirds in the forests as you cross the border into Queensland and head for Mt Barney, Rathdowney and the Scenic Rim. Some people say that for a more adventurous journey over the rim, take the border loop road from NSW to Rathdowney in QLD. Note that this route is not suitable for trailers, as it is quite narrow in some spots, fords 6 splash crossings in New South Wales, and is gravel on some parts. It passes through the Border Ranges National Park, and parallels the Spiral Loop railway line which carries passenger trains and rail freight between Sydney and Brisbane. Lions Loop Rd is an amazing project of the Lions Club and local communities which started in 1971, and forms a scenic link between QLD and NSW. A very informative brochure with directions, and showing camping grounds, rest and picnic areas, is readily available at local tourist information centres and tourist outlets. About 45 klm south of Woodenbong turn left* into Wilson's Avenue from the Summerland Way, follow the road, turning left at the Simes Rd "T" intersection (unless you want to detour to Border Ranges National Park), follow the main road to the top of the rim, and have you camera ready! (* If coming from the south it's 30 klms north of Kyogle and 10 klms north of Wiangeree, and turn right). The Richmond Valley Council and Kyogle Council also jointly publish a comprehensive touring guide containing maps, scenic drives, calendar of events, history, accommodation, tours, attractions, and more, which is available from visitor information centres and tourist outlets. At all compass points, you can visit state forests and World Heritage listed national parks with camping and picnicing facilities including tables, barbecues, toilets and (limited provided) tank water. An array of walking tracks of various grades and difficulty, provide bushwalking and birdwatching opportunities, along with many scenic drives suitable for 2WD (in dry weather) to prominent lookouts and outstanding views. Dairy Flat cows coming home © Courtesy Woodenbong Progress Association. Koreelah National Park. 30 Klm west of Woodenbong you can experience one of the State's western-most rainforest areas. Pockets of World Heritage listed rainforest hug the steep slopes below Acacia Plateau and Mt Wilson, while a small grassy area beside Koreelah Creek provides a pleasant camping spot with BBQ, picnic and toilet facilities. Mt Barney National Park Rugged mountain peaks rise above the surrounding landscape in this wild, beautiful, World Heritage-listed park, popular with bushwalkers and home to many rare animals, plant species and communities. Only walk-in bush camping is available in the park and there are strict limits on the number of people who can camp at each campsite. It is strongly advised that you buy a camping permit well in advance; 6 to 8 weeks for public holidays and 3 to 6 weeks at other times. Toonumbar National Park At 14,991 hectares Toonumbar National Park contains two World Heritage listed rainforests; the Murray Scrub and Dome Mountain Forest, which are part of the Gondwana Rainforests of Australia. Located 20 klm east of Woodenbong, this park is mostly undeveloped, however facilities are provided for camping and picnicing. Road Getting here: Woodenbong is approximately 1100 kilometres - about 11.5 hours drive north from Sydney via Casino on the Summerland Way, and about 160 klm - approx. 2.5 hours drive south from Brisbane, via Beaudesert and Rathdowney along the inland Mount Lindesay Highway route. 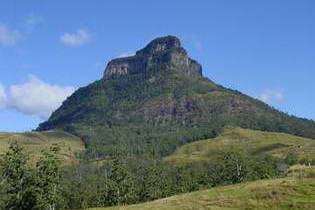 Woodenbong is about 61 kilometres (klm) north of Kyogle via Wiangeree on the Summrland Way. Urbenville is about 12 klm south of Woodenbong and 37klm north of Bonablo on the Clarence Way. You can also get to Woodenbong via Tabulum on the Bruxner Highway, from Tenterfield (New England Highway) on the Northern Tablelands. The nearest airport at Lismore, which is about 116 klm south via Kyogle and Casino, has regular commercial services from Sydney, Brisbane and other regional NSW centres. Daily flights are available from all major cities to Gold Coast Airport (about 160 klm) and Brisbane International Airport - Eagle Farm (about 147 klm), both routes about 2 hours drive via Beaudesert and Rathdowney. A number of international carriers servicing SE Asia, New Zealand and the Pacific fly into Gold Coast Airport. Airport car hire and other car rental services are available at all airports. Daily or overnight train service operates from Sydney to Brisbane, with pick up and set down at Kyogle when required, with local transport service connections from there. Daily coach services from Brisbane and Sydney, opererate via the Pacific Hightway coastal route, or inland New England Highway via Tenterfield. See Woodenbong and Urbenville - Transport Services Information for more transport information, including trains, coach and local bus schedules, taxis, airport, and transfer services. Northern Rivers Carpool provides locals and visitors with the opportunity to share transport in the region.